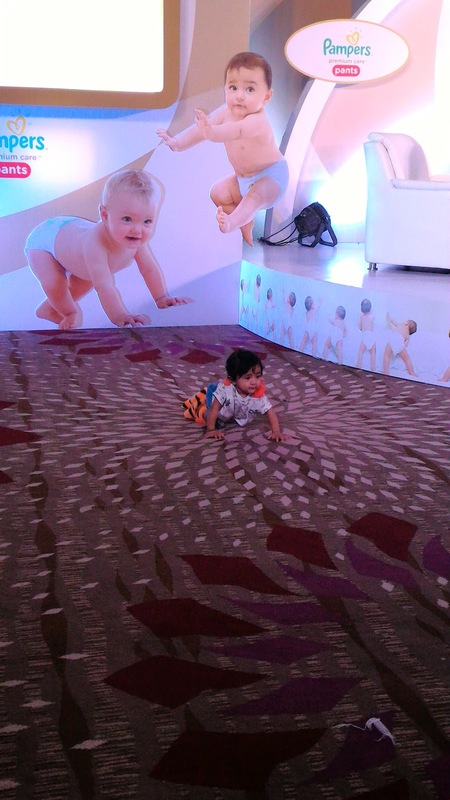 Last weekend I was invited for the preview launch of a new product by Pampers. Curiosity got the better of me, and I stalked them on their social media handles, and soon enough knew that they're launching a new range of premium diapers! That was really exciting news for me because of 2 reasons: 1st being that I have a 11 month old baby and 2nd being that I swear by the Pampers Active Baby diaper, they've been the best one in the market, until now maybe. The stage was all set up and I love the way it was done! Cuteness everywhere. I had taken my baby along for this one because I was told I could. Though that was not the best decision ever, it was a good experience and his he had his first celebrity moments (coming to that later). A lot of parenting and mommy bloggers were gathered, I even met a couple of them who I knew virtually. We were all excitingly waiting for the program to start. We had a panel of experts & celebrity moms talking about baby care, skin care, diapers etc. 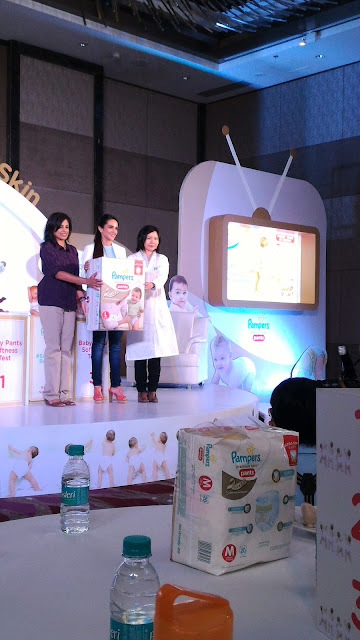 Mandira Bedi brought to life the importance of skin health in infant baby & how a soft & dry diaper can help babies have the best skin comfort and happy development. 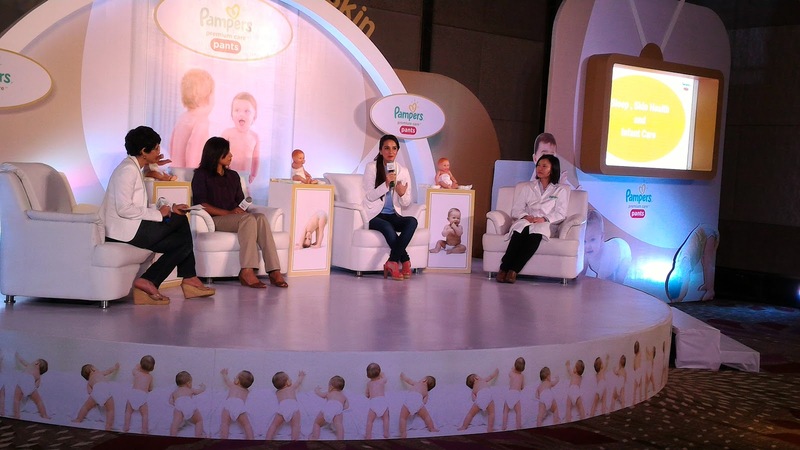 Ajita Gopal Seethapalli, a child sleep consultant talked about the importance of a comfortable, soft diaper for a baby to sleep through the night. We also had celebrity mother Tara Sharma who spoke of her experiences with Pampers, raising her two kids and lastly we had Dr. Wei Sing Long the Pampers R&D expert, tell us how this premium pampers range is unique. 2) All-around waistband for a comfortable, snug fit. Dr. Wei also mentioned a point that just because a diaper can hold up to 12 hours, does not mean you keep the baby in that diaper of 12 hours. It is meant for them to sleep comfortably through the night, which is about 8-10 hours. There were live demonstrations of the quick drying gel, lotion on the diapers, etc. We were all even made to do a blind test (image above) where we had to feel and vote for the diaper that felt the softest. 90% of us voted for number 2 which was indeed the pampers premium pants. My baby was so excited that I just could not restrain him to sit with me. In fact he kept swiftly crawling from one end of the set-up to another, drawing quite some attention from the panel, audience and photographers. Haha, I can't blame him for being a happy super-active child, he's a pampers baby after all. We also saw a few super adorable and emotional video clips by Pampers. He also had his celebrity moments with Tara Sharma & Mandira Bedi! Haha.. look at the way he's staring at these beautiful ladies! There was a Q&A round, post which we were given a hamper including the new premium pants and a few P&G samples. In a country like India, best vastu consultant in mumbai is considered one of the basic requirements while constructing a property or building according to pre-specified principles. It is necessary to follow these principles for wealth, health, fame and prosperity in life. Though it has become difficult to follow each and every principle in the present era, it is important to make maximum use of tenets in order to achieve peace and harmony in life.